In 12-inch nonstick skillet, heat vegetable oil over medium-high heat. Add green onion whites, carrots, gingerroot, garlic and pepper flakes; cook 2 minutes, stirring occasionally. Stir in frozen cauliflower and edamame. Cover; reduce heat to medium. Cook 8 minutes, stirring occasionally. Push vegetables to edges of skillet, and stir in eggs; cook 2 to 3 minutes, stirring occasionally, until eggs are thickened throughout but still moist and creamy. Fold eggs into vegetable mixture; stir in soy sauce and sesame oil. Divide between serving bowls; top with green onion greens. 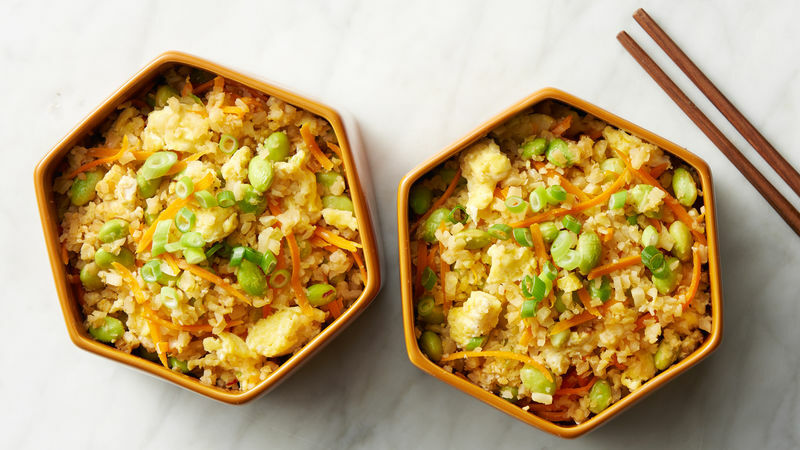 Frozen riced cauliflower rice is an easy way to include more vegetables in your meal without all the work of chopping fresh cauliflower. Save time with preshredded carrots.